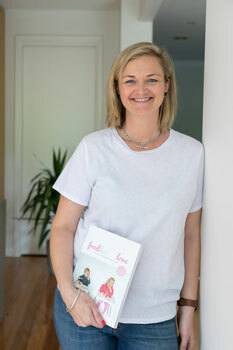 Emily Dupuche, mother of three and author of best-selling feeding guide, Food Babies Love, has spent the last three years creating her own range of Fresh Pots to provide parents with fresh convenient, healthy baby and toddler food just like home-made. She explains why texture was such an important part of developing the range. 'Like all parents, I celebrated my children's developmental milestones: rolling, sitting up, crawling, first words and of course introducing solid food. While there are lots of conversations around when to start babies on solid food, there's much less discussion about the texture of solids. Why is this important? There is a growing body of evidence showing that texture, introduced at the right time, is important for encouraging a life-long enjoyment of food as well as being vital for speech development. 'It's common to start babies on purees – either individual purees or blends are fine – but after a few weeks it's important to start introducing protein and texture. Texture can be mashed, lumpy or chunky. Work with your baby to assess what they can manage. 'A study published in the British Journal of Nutrition1 suggests that experiences with different textures early in life might facilitate infants' acceptance of more complex textures at a later stage. 'What this means is that offering textures at the right age may improve their dietary choices in the future. And having more food choices increases the nutritional content of meals. 'Introducing lumpier food textures is not only important for nutritional reasons but for speech development. 'When babies bite and chew they're using the same muscles as those which are needed to form letters and words. Chewing requires the lips and tongue to be activated and helps strengthen the jaw – all important for different speech sounds. 'It's understandable that parents may be concerned about their baby gagging or choking on lumpier foods. However, gag-reflexes are a normal part of learning to eat and not to be confused with choking which is when the airway is blocked. 'I've ensured my Fresh Pots are packed with lumpy wholesome goodness ideal for bubs 12 months+ but, just like homemade food, you can always mash them up with a fork or blend for a smoother texture. All babies develop at different rates and you'll know when your baby is ready." Australian mumpreneur and best-selling author of Food Babies Love, Emily Dupuche, has succeeded in her bid to extend supermarkets' fresh food offering for babies and toddlers with her range of Food Babies Love Fresh Pots now on sale nationally in Woolworths. The passionate Melbourne mother of three has long advocated for supermarkets to stock fresh baby food and is delighted that today's parents and carers can now pop Fresh Pots into their shopping trolley. 'In the past, convenience often came at the cost of quality with many pre-prepared baby and toddler food offerings a far cry from what we'd make at home. Now, being time poor no longer needs to mean inferior quality food. 'Fresh Pots are packed with real, quality ingredients without compromising on nutrition or taste. They're textured and delicious, with nothing artificial – just like homemade. 'I know parents can feel guilty if they don't have time to make food themselves and worry that they're not providing their bub with all the nutrients and texture they need. Now, if they're working late, going out, on holiday, or just every day busy, parents have a convenient and healthy fresh food option that their children will love." The popularity of Dupuche's, Food Babies Love; a guide to introducing your baby to solids (published by Pan MacMillan) was the catalyst for the Fresh Pots range. Since its release in 2012, the guide has become a best seller and a trusted resource for parents. 'We've created the Fresh Pots range from some of the much-loved recipes in the book," explained Mrs Dupuche. 'Until now they've been available through a select number of independent stores and online so it's very exciting to be able to offer my range Australia-wide." 'I firmly believe that what we feed our babies and toddlers determines their adult eating habits," said Mrs Dupuche. 'Having access to convenient and high quality fresh food is so important for their growth and development." 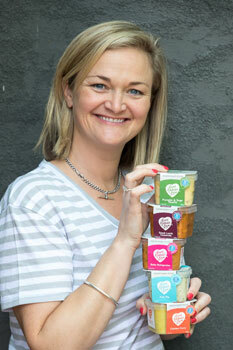 The Fresh Pots range has been created from the proven favourite dishes in Emily's book, Food Babies Love. Food Babies Love Fresh Pots are available in the kid's yoghurt section in selected Woolworths nationally. Question: At what age should parents begin introducing food to their children? These are all signs that your baby may be ready for solids, remember there is no set age but it's important to have begun by 6 months of age as their iron requirements increase at this age. Question: What are the best food for the initial introduction? Emily Dupuche: Rice cereal is a very easy first food for baby to digest and it is quite flavour neutral. But you can start directly on vegetables and some fruits. I do suggest not starting with really sweet foods such as apple or pear as this can develop a preference for sweeter goods as they move on. You can start with single foods or a blend. Question: Can you explain the importance of textured food to a child's speech development and eating habits later in life? Emily Dupuche: Managing Texture is really important for helping oral muscle development which in turn supports speech development. When a baby bites and chews, they are using the same muscles as those which are needed to form letters and words. Chewing requires the lips and tongue to be activated and helps strengthen the jaw – all important for making different speech sounds. In addition to this important oral motor development, studies have proven that children exposed to varying textures influences the acceptance of broader textures later on. This in turn allows them to enjoy a wider more nutritionally sound range of foods. Question: How can picky toddlers learn to love food? Emily Dupuche: It's really important to remember that picky or fussy eating is not a disease, it's a behavior. And most commonly it is driven by the behaviours of parents. Right from the word go it is really important that parents don't -give in' to the demands of their children.. From the very first time a plate of steamed greens is pushed aside by the baby and replaced by beige buttery pasta that child has learned that they can control what they eat. If your baby refuses to eat what you serve, simply pack the meal away, clean them up and take them out of the high chair. Meal time is over. They also quickly learn that if they are hungry they need to eat what is served. If you already have a head strong toddler who is -picky' then you need to clearly communicate with them that the rules are changing and from now on they eat what they are served and there are no snacks or second options (you can manipulate this a bit to ensure they don't starve by offering 1 meal in every 3 or 4 that you know they will eat). This may sound a bit tough but it does work, just take a brave pill and make sure you and your partner agree to the process. You have to be on the same team. Ever wondered why your child eats everything at day care but only beige food at home? Because they are playing you! Beyond all this, talk to them about food, involve them in the kitchen, let them touch and smell ingredients, model positive eating behaviours yourself, and importantly – cook with love and flavour! Question: What inspired you to write Food Babies Love? Emily Dupuche: My experiences with my twins. I remember been uncertain about what I had to do but once I was underway I really enjoyed coming up with exciting meal options for them and took such joy in watching their little faces light up with pleasure with each new flavor they tried. I realised that babies don't need or want bland and boring food and that for many parents' solids is just another overwhelming phase of parenting. I knew I could help by providing a simply and practical approach. Question: Are you able to share a recipe from Food Babies Love? Question: What motivated you to then make fresh, readymade meals? Emily Dupuche: Whilst I love cooking and am always happy to make time for it, for many people this is not the case. Lots of people don't enjoy cooking or lack the confidence, but every parent knows what it's like to be time poor! This coupled with the poor-quality range of convenient baby and toddler meals in supermarkets which were all heat blasted for extended shelf life made me realise that it was our children who were missing out on the opportunity to enjoy fresh wholesome and delicious food. It also worried me that me the leading format was pouch, which can lead to oral motor delays from both the super smooth texture and lack of chewing required. Our babies deserve better. So I set about creating a better alternative for time poor parents which would deliver better nutritional outcomes for our children, setting them up for a lifetime of positive food enjoyment. Question: Can you tell us about the Fresh Pots? Emily Dupuche: My Fresh Pots are 100% Fresh baby food. They are made from all natural local ingredients and contain no added preservatives, fillers, stabilisers, salt or sugar. They are pure real food made just like homemade – they look and taste like real food should! All of the convenience, none of the compromise. They are lumpy in texture but can easily be mashed to suit a younger baby's needs. There are 6 flavours in the range; Greek Lamb Casserole, Red Lentil Dahl, Chicken Curry, Baby Bolognaise, Pumpkin and Sage Risotto and Fish Pie. They are available in Woolworths stores nationally and selected independents. Find them in the fridge next to the kid's yoghurts. Question: What are the key ingredients included in your Fresh Pots? Emily Dupuche: Local fresh ingredients! The range is all based on proven favourites from my book so parents know exactly what they are getting!